Callin' Oates: The Hotline You Don't Need (But Might Call Anyway) A new hotline puts the music of Hall & Oates at your fingertips. The question, of course, is: Why? 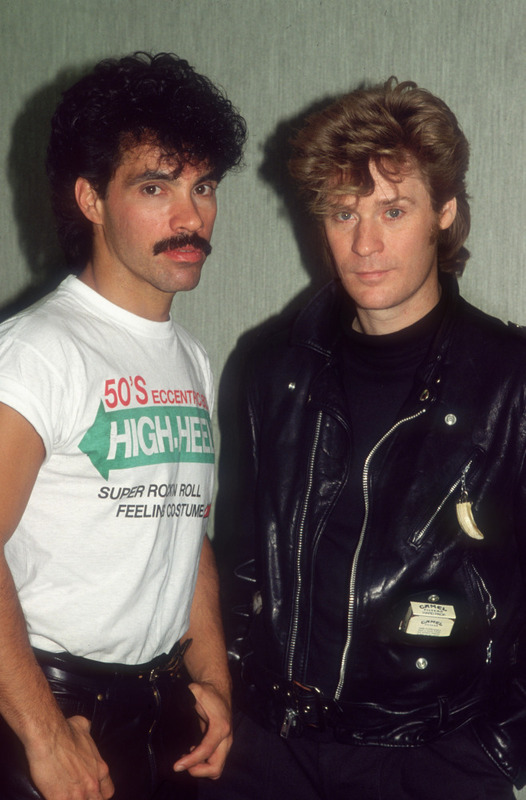 John Oates (left) and Daryl Hall (right) of pop duo Hall & Oates, seen here in 1987. These days, they're available on your phone. Is it pure whimsy that makes something like "Callin' Oates" appealing? If you pick up your phone and call 719-26-OATES — at least as of this writing — you'll get a computerized woman's voice telling you what numbers to press to hear one of four Hall & Oates songs. The question, of course, is ... why? In the age of Spotify, iTunes, YouTube, why would you pick up your phone to listen to a tinny rendition of "Private Eyes," like you're on hold with customer service? It's hard to imagine why this would be an appealing way to listen to anything, unless you were trapped at the bottom of a well. And you had access to a phone. And despite being trapped at the bottom of a well, your biggest priority was listening to "Private Eyes." Let's agree that valuing this hotline for its sheer utility requires a fairly elaborate scenario to be devised. So obviously, it's not the music. It's the idea. It's the idea that if you pick up your phone and dial a number, a robot lady plays Hall & Oates music on command. People like making things happen and the weirder, the better. It's a Jack-In-The-Box for adults (and semi-adults). You press the button and something happens that you don't need to happen at all. A recent Wired article about a game called Cow Clicker might be instructive: the makers of that game managed to make a success out of what was originally meant to be a satire of social media trifles — it involved clicking on a cow for the pure sake of clicking on a cow. As the hotline's developer told the Atlantic Wire, Callin' Oates started as a demonstration project for his communications job at Twilio, a company that ... basically makes applications that do things like this, although presumably, it can make ones that are somewhat more utilitarian. The guy created it, he got it retweeted by a New York Times tech columnist, and there you go. Presumably, Callin' Oates doesn't have an extraordinarily long shelf life (though it does have its own Twitter account), since there's only so much time you can spend on the phone listening to "Rich Girl."